I am a keen adopter of new technologies and as a result I sign up for account on most new social networking related sites. People sometimes as me how I manage to find the time to keep all of these accounts active. However, the truth is I can't keep active on all of these different sites, but with clever management of the feeds between the different services it is possible to give the appearance of being active on all of them without actually logging into most of the sites in question regularly. While Facebook is most popular among young students, LinkedIn is a social network more popular with older professionals. There is a large overlap between the people registered on both sites, but if you want to maintain links with all of your friends, you really need an account on both services. Since people seem to spend more time keeping their status updated on Facebook or Twitter than LinkedIn, LinkedIn has a feature that you can enable to automatically import status updates from the other platforms. This has the benefit of making it seem like you are paying more attention to your LinkedIn profile than you really are, but you need to be careful because the social norms on LinkedIn are radically different from Facebook and what is seen as a really cool status update on Facebook, might seem highly inappropriate on LinkedIn. I use Foursquare for sharing with my friends details of where in the world I happen to be located at any one time. I like Foursquare because it is most fun to use, but since only a sub-set of my friends are active users of Foursquare I have configured it to automatically share my activity on Facebook and Twitter. Although some of the non-users of FourSquare are puzzled to read the announcements that I have become mayor of some arbitrary place, I get more comments and feedback through these other platforms than I get on FourSquare itself. I track my exercise using the MyTracks application on my Android phone. This is a really handy application which uses the GPS in my phone to keep track of how fast and far I have been running or cycling. The data collected by this application is truly amazing, but it is not really a very social application. So when I want to share my training data with friends I like to use the DailyMile site. This site can automatically share information with both Facebook and Twitter. Luckily a colleague from IBM has developed a really handy Android application called Tracks2Miles which automatically transfers data from MyTracks on to DailyMile (which in turn shares it on Facebook and Twitter - which in turn feeds LinkedIn). Bit.ly is a popular URL shortening service. If you create an account on this service and associate your Twitter and Facebook credentials with your bit.ly account, then you can automatically share a status update to both services at the same time as shortening a long URL. 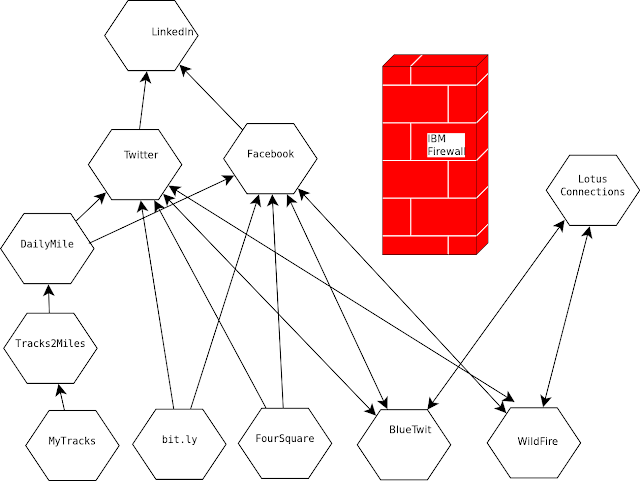 If you wish to interact with social networks inside IBM, security restrictions mean that web based tools can't help. However, BlueTwit sidebar is a Firefox extension that is available inside IBM. It is useful because it allows you to conveniently read and write status updates from several different social networks both inside and outside the IBM firewall from a single UI..It is available as a sidebar whenever you have Firefox open (which is most of the day for a lot of people). In a similar vein, WildFire is an open source extension available for Lotus Notes that allows me to read and write social network updates to a large number of different social networks from a single UI. It is really handy for anyone who has the Lotus Notes client running all day long (most IBM employees fall into his category). While these automated tools are really handy and save me a lot of effort, they do have one significant drawback. Although they give the impression that I am active on several sites, and alert human can easily detect the fact that I am not really engaged. For example, there is no way for an automated tool to read what someone else has written and leave them a thoughtful reply. Most social software experts advise that you should spend at least twice as much time reading as you do writing (in real-life nobody likes people who turn up at a party and talk incessantly without listening - this is what these tools make you look like online). In fact some people feel so strongly against automated tools like the ones I described here that they refer to them as "anti-social software"
This problem can be partially overcome by setting up email notifications (most social network platforms can be set up to periodically email you a summary of recent activity that might be of interest so that you can respond to some). A service that I don't use much any more is ping.fm - but if you really want to automate your status updates this is the tool for you. It is capable of connecting a huge variety of social networking sites and it is even extensible so that if support for your favourite network is not yet enabled, you can add it yourself. A really neat feature of this platform is what they call vocabulary expansion, this allows you to put special tags into your status updates and have the system intelligently replace these tags with something different when propagating your status update each of the target platforms. However, this feature never really caught on since most social networkers are more interested in vocabulary contractions than expansion.